This article will provide instructions on how to load data edited in the Heart Rate Variability (HRV) analysis application into the Impedance Cardiography (IMP) analysis application, and vice versa. The benefits of loading previously-edited ECG data are time-savings and editing consistency. You don’t need to re-edit the ECG waveform, e.g., if R-peaks were edited in HRV these edits will now be carried over into the impedance application. Caution: It is not always appropriate to use HRV edits in impedance or vice versa. See our blog post on the topic. 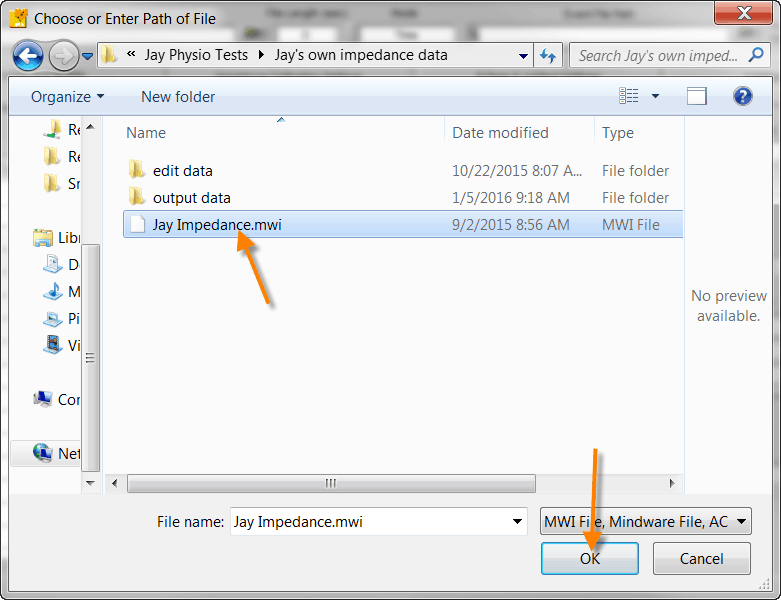 Step 1: Open the Impedance application and select the .mwi file that contains the HRV edits. Do not attempt to load the .edh file at this point. 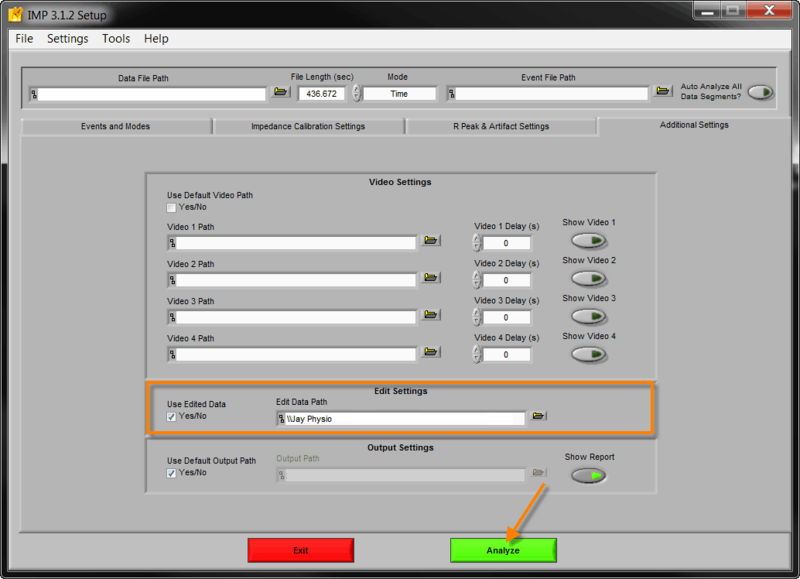 Step 2: Select the “Additional Settings” tab and click the box under “Use Edited Data” found in Edit Settings. Step 3: After the “Used Edited Data” box has been checked, a new window will appear. At this point, the edited data file that was created during HRV analysis should be loaded. 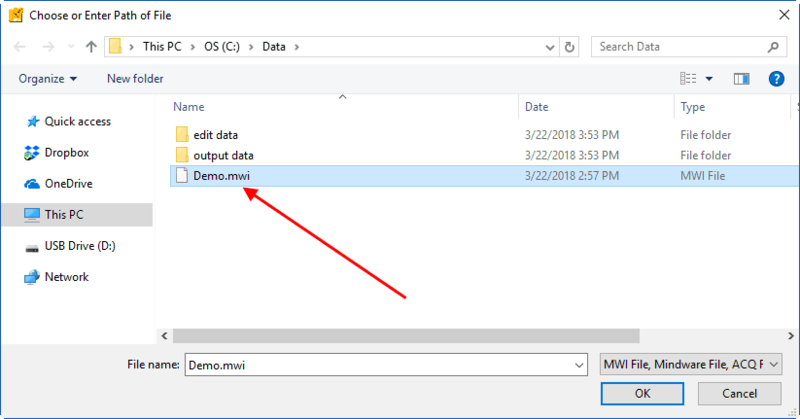 This file will end with an “.edh” extension and can be found inside of the “edit data” folder alongside your .mwi file. 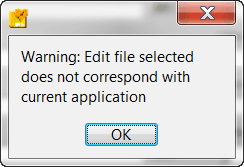 Once an .edh file is loaded into the impedance application a warning will appear because the edit file was not created with the impedance application. (An edited data file that was created in HRV will contain the extension of “.edh” with the “h” standing for HRV. An edited data file that was created in the impedance application will contain the extension “.edi” with the “i” standing for Impedance.) This warning will appear whenever HRV edits are loaded in the impedance application or vice versa. 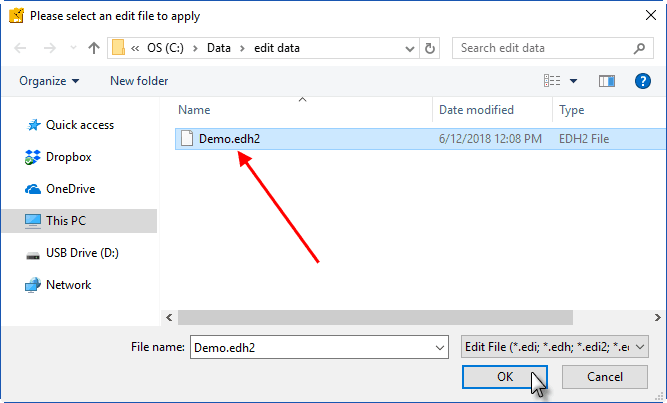 Step 4: Once the .edh file is loaded the “Edit Data Path” should have the location of the file that was just selected. Once this is in place the file is ready to be analyzed. First, open the data file which has been previously edited in HRV. Next, on the Channel Map screen, select an Existing… edit file. 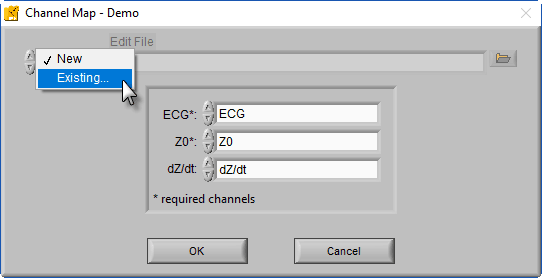 Navigate to the HRV edit file (either .edh or .edh2 file extension) and press Ok.
Notice that the ECG channel selection has been set automatically and is disabled. This is because the edit file is enforcing the use of the ECG channel which had previously been edited in HRV. 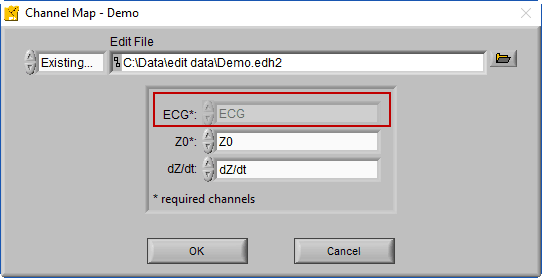 Select the appropriate impedance channels (Z0 & dZ/dt) and press OK.
On the Setup screen, you will also notice that the ECG filter settings are disabled as well – these are enforced by the edit file to ensure that the data is viewed in the exact way that it was edited. Another important setting to consider when using HRV edits in IMP is Ignore Estimated Beats. 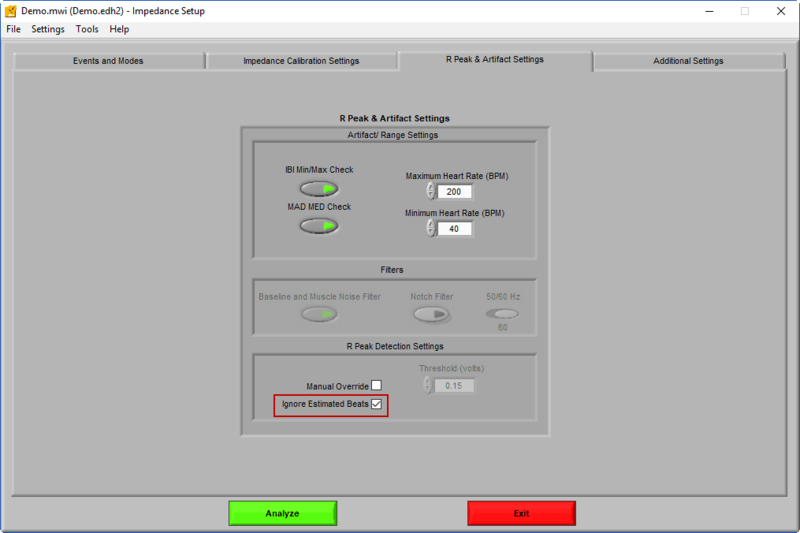 This setting will ignore any beats which were marked as estimates during HRV editing (such as midbeats) when building the Ensemble Average. These beats would typically corrupt the Ensemble Average, so ignoring them will reduce any additional editing that is needed in the IMP application. You will typically want to turn this setting on when using HRV edits. Press Analyze to proceed with the ECG edits from HRV. 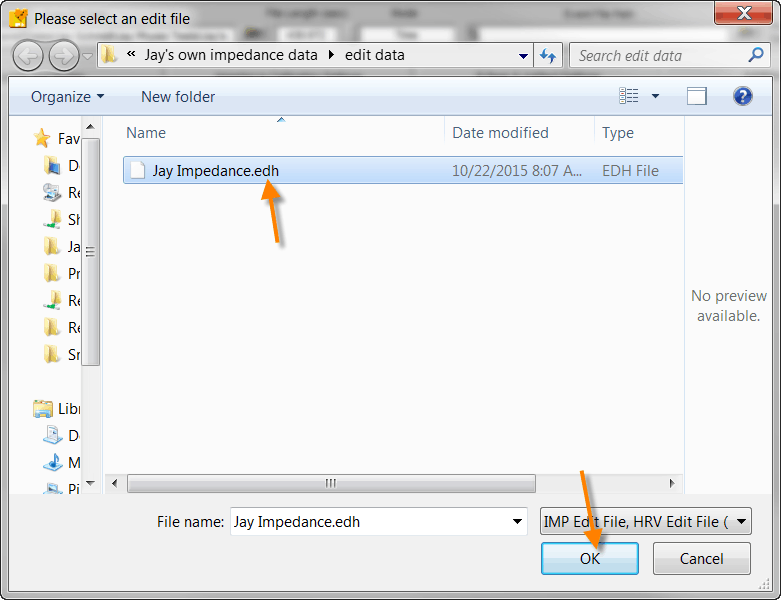 Any new edits made will be saved to a new Impedance (.edi2) edit file.